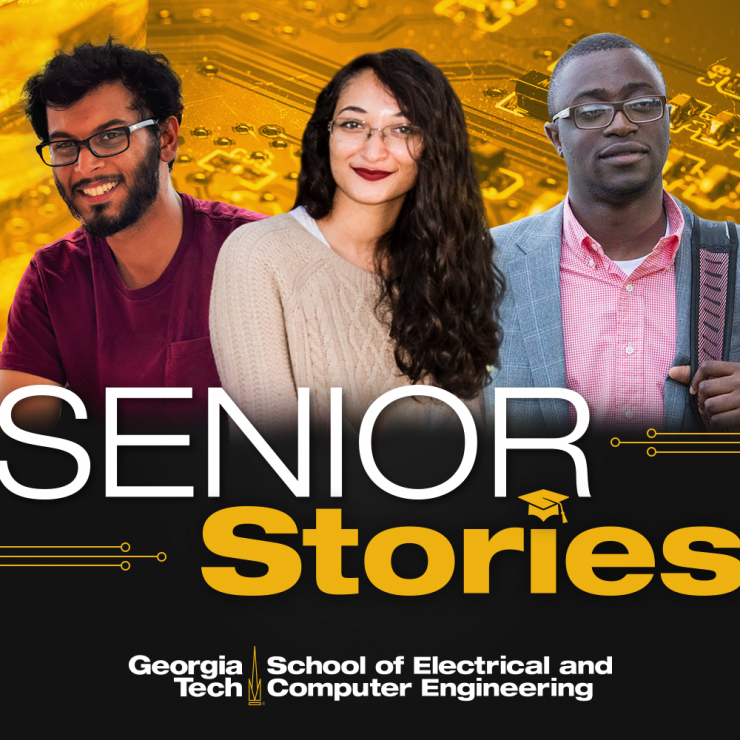 This spring, more than 200 seniors in the Georgia Institute of Technology's School of Electrical and Computer Engineering will walk across the stage and receive their diplomas. Each one of them has a unique story to tell about their time at Georgia Tech. Here are three of those stories. Having lived in several countries, Varun Duggal has seen how reliable access to energy separates the haves from the have nots in ways both profound and superficial. A seemingly inconsequential act of charging a cell phone can mean freedom, empowerment, and even the ability to support a family in some rural, developing parts of the world. The lack of dependable energy has direct bearing on education, health, and economic opportunities and in many in cases leads to mass migration and over-urbanization. Duggal wants to change the way energy access is addressed in some of the poorest areas in the world. Through his work with distributed energy systems, he hopes to make affordable and scalable systems for rural electrification, bringing energy closer to the point of consumption and bypassing the need to connect remote and rural areas to the grid through expensive infrastructure. Duggal, an electrical engineering major, grew up in Germany until the age of 10 when he moved to India, his home country. He also attended high school in the Philippines before coming to the United States for his undergraduate studies at Georgia Tech. Living in multiple countries taught him a lot about how access to electricity relates to quality of life, success, and happiness. He also saw how in countries like the United States and Germany with massive, centralized energy grids that feed both rural and urban areas, people have equal access to basic amenities, whether they live in the city or the country. However, this cannot be said for developing countries like India where rural means undeveloped, often lacking enough power and clean water. “In developing countries, economic prosperity directly correlates to energy access. I could ask someone how many hours of power they get and guess their income. The rural areas of developing countries always get the short end of the stick,” said Duggal. During the summer of his third year, Duggal took an internship at Grassroots and Rural Innovative Development (GRID) an India-based social enterprise aimed at providing affordable electricity and clean drinking water to rural areas of India. India holds 240 million unelectrified people and 163 million of its people don’t have access to clean water. At GRID, Duggal was the technical lead on a project that used distributed energy to run water filtration systems designed for villages. Duggal is also deeply involved in a project to provide affordable off-grid power to a health center in the rural village of Thoman, Haiti, through Georgia Tech’s Institute of Electrical and Electronics Engineers (IEEE) Power and Energy Society (PES) and the Opportunity Research Scholars (ORS) program. His ORS team created a scalable system that uses solar energy to provide power for necessities such as mobile phone chargers and lighting in family homes, transforming the lives of the residents. This modular system can be scaled up to meet larger power loads. “Powering your own phone is a huge source of empowerment and having lights means the day doesn’t end with the sun. This access to electricity allows entrepreneurship to thrive. Businesses can be conducted on the phone; people can keep working and studying into the night,” said Duggal. After this initial success, Duggal and his team are working on different systems which can power smaller appliances such as fans, TVs, and refrigerators for small businesses and homes. Another aspect of the work that IEEE PES is doing is an initiative to teach Haitian students how to design solar power systems like the ones created by Georgia Tech students. With technical capacity building and training from Georgia Tech researchers and Haitian university students, local entrepreneurs can replicate and scale up these solar systems leading to the development of small businesses in the area. The day after graduation, Duggal will travel to Haiti to conduct this training program with the IEEE PES Haiti Solar Team. In the fall, he will enter a master’s program in Energy Science and Technology at the ETH Zurich in Switzerland. “There is need to provide energy access for a large part of the global populace and therefore an urgent need to build simple and affordable systems that are replicable and scalable. I need to do more research and contribute further so that I can be a part of the solution,” said Duggal. In the fall of 2016, the new Interdisciplinary Design Commons (IDC), was just a dream in the minds of ECE leadership. Funding had just been secured to renovate the Van Leer Building Rotunda into a 15,000-square-foot, state-of-the-art makerspace. Ground was yet to be broken and no one knew exactly what to expect, but computer engineering major Hiba Murali knew she wanted to be involved in whatever form the space took. It was decided that the IDC should have a student group that would provide insight on how the space should be designed and used and would eventually run the space as a nearly autonomous "for students, by students" facility. Murali, who is the vice chair of Georgia Tech’s Institute of Electrical and Electronics Engineers (IEEE) chapter, joined with a small group of five other students who were interested in spearheading the makerspace's student organization, The Hive. In 2016, The Hive was founded as an interdisciplinary engineering organization aimed at fostering the growth of the “maker culture” among Georgia Tech students. In 2017, The Hive was chartered and became an official student organization. Murali started as the director of communications on The Hive’s executive board. Part of her job was to educate the Georgia Tech community about the IDC and its eventual resources and services, but also to find student volunteers to help bear the responsibility of managing the huge space while increasing student engagement and interest in "making stuff." With the help of faculty advisor Dr. Bonnie Ferri and staff advisor Kevin Pham, the space will be completely run by the student executive board and student volunteers called Peer Instructors. Murali faced two big challenges as she began to organize events and solicit student volunteers. First, was the misconception that the space is only for ECE students. "It’s open to all Georgia Tech students, no matter their major or class year," said Murali. "We aim to develop a truly multidisciplinary, collaborative space where students can learn from each other and work together on awesome projects that they come up with." The second challenge was that fact that the IDC was still under construction. There was growing excitement and interest in the makerspace, but disappointment inevitably hit when students learned that the building wasn't yet open. “It was a little strange because we were this group that was founded to organize and eventually run the makerspace, but we didn't even have the building ready to move into yet," said Murali. "We were kind of homeless, but the benefit was we were building our organization from the ground up in parallel with the actual building. It has allowed us to work on creating the culture of the organization and focus on developing various processes for when the building is finally finished, so we can ensure that everything runs as smoothly as possible." Now that the IDC is nearly complete (the facility is expected to open this summer and add more equipment and resources into the fall), Murali and the others who have been involved from the beginning can really see all of their work come to fruition. And while they aren’t out there laying the bricks or installing the windows, there’s a genuine sense of ownership. “We didn’t physically build the space, but we put the heart into it and built the organization from the ground up, and that’s something that we’re so proud to share with the Georgia Tech community,” said Murali. The timing of the ribbon cutting couldn’t be better for Murali. She plans to enter a master’s program at Georgia Tech this fall, so she won’t have to miss a minute of the new space in its fully functional glory. Computer engineering senior Olatide Omojaro, who is originally from Lagos, Nigeria, uses a singular point of motivation as he pursues his academics. He says “yes” to every opportunity for education because his mother was not able to go to college. Cultural and financial constraints dictated that education was more important for boys. Passed over in lieu of her two brothers, she went on to start her own company with just a high school diploma. “I use her story as inspiration to keep going and to grab each chance presented to me to keep learning. My summer undergraduate research programs, internships, entrepreneurial and volunteer activities, and now graduate school—it’s all for her,” said Omojaro. Omojaro, who will enter the Ph.D in Electrical and Computer Engineering program with a focus on Robotics and Intelligence at Georgia Tech this fall, began his studies at Georgia Perimeter College and transferred to Georgia Tech his junior year. While at Georgia Perimeter, he met with the founders of African Research Academies for Women (ARA-W) and joined the team of executives with other collegiate colleagues around the country. The organization pushes to increase the representation of women in professional science, technology, engineering, and math (STEM) fields in developing countries by providing summer research opportunities for female university students in Ghana. As a member of the board of executives for ARA-W, Omojaro is responsible for analysis of participant data as well as creating a web-based professional social mentoring network. The next goal for the organization is to expand the program into Nigeria and eventually other developing nations, giving more women the opportunities his mother never had. So far, Omojaro’s “yes” attitude has paid dividends. His work with ARA-W earned him a President’s Volunteer Service Award in 2014. He has been granted a GEM Fellowship from the National GEM Consortium and a Graduate Research Fellowship (GRF) from the National Science Foundation (NSF) to fund his graduate studies. But he’s mindful of crediting those who helped him along the way: his friends and family, the staff at the College of Engineering’s Center for Engineering Education and Diversity (CEED), and his undergraduate mentor Associate Professor Linda Wills. “My friends and family, Dr. Wills, and the CEED family have been huge components of my support system. I owe them a great deal,” said Omojaro. This summer, Omojaro plans to mull over the many startup ideas he’s got floating around in his head and start thinking about choosing a graduate advisor. He will also be interning at Intel where he will conduct research on self-driving cars. Perhaps surprisingly, for a man with so many current projects and so many accomplishments already behind him, he doesn’t see himself as being goal-oriented. “I prefer not to be bound by goals because I never want to consciously limit my potential. The minute you make a goal, you’ve shut off the possibility of something even bigger and better. I say to always dream big and you might just end up somewhere you never would have imagined,” said Omojaro. 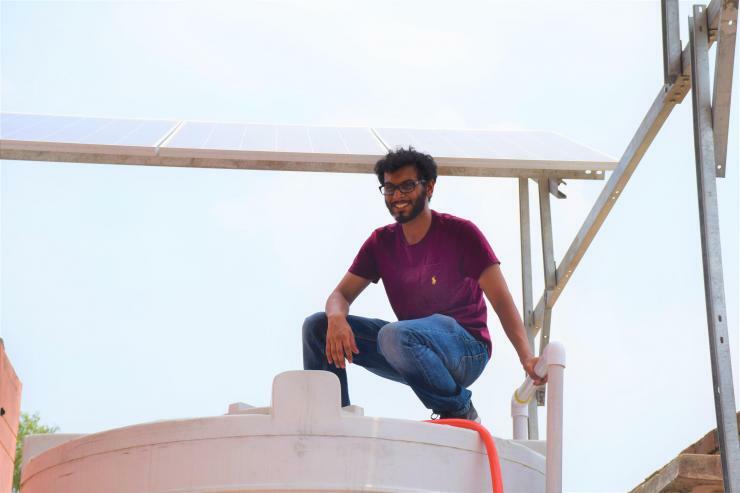 Duggal sits on the top of the filtered water tank under the solar panels that power the water purification facility during his internship at GRID. 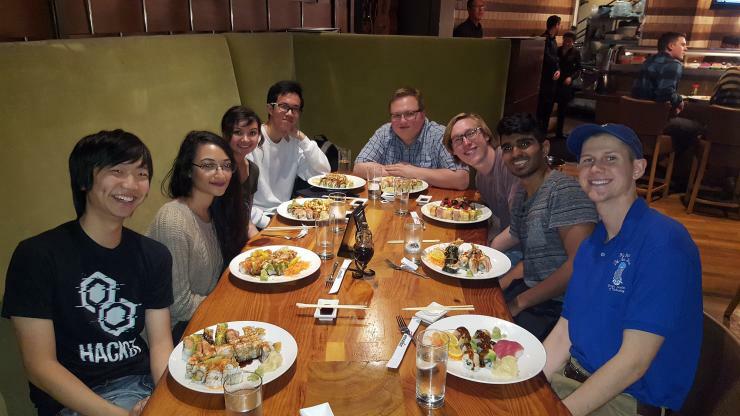 Murali (second from left) at a dinner with her fellow The Hive officers. 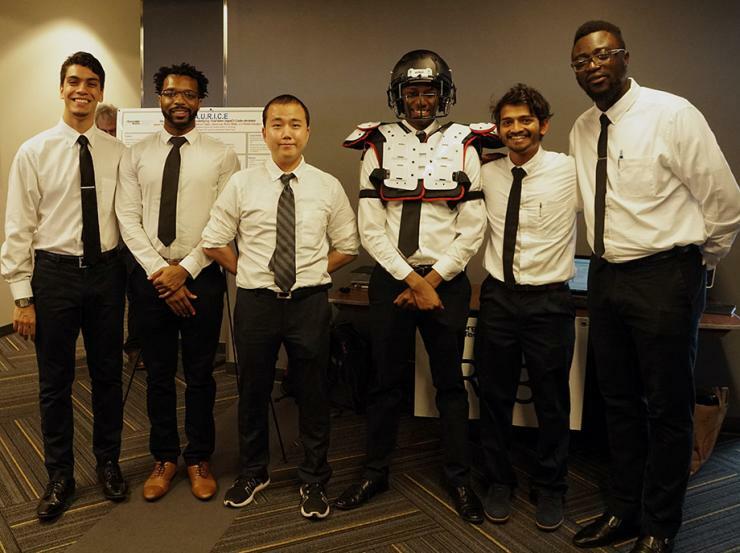 Omojaro (far right) poses with his senior design team at the Capstone Expo.